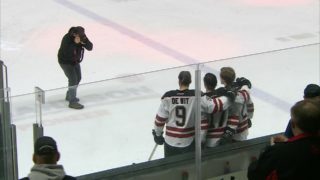 LETHBRIDGE — The Red Deer Rebels performed with a definite sense of desperation Friday night, almost like they were looking two months ahead. 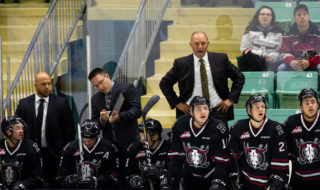 “We played with a playoff mentality and obviously found a way to win,” said assistant coach Brad Flynn, following the Rebels’ 3-1 WHL victory over the Lethbridge Hurricanes in front of 4,176 fans at the Enmax Centre. 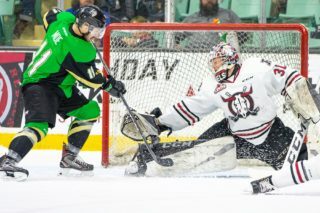 “We dug deep, made some big blocked shots at the end and had a huge five-on-three penalty kill when it was tight and got some big saves from Andy,” said Flynn. Anders finished with 35 saves and was recognized as the game’s first star. 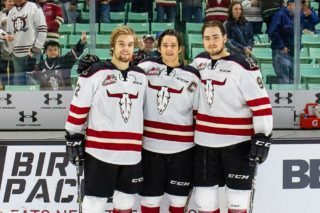 He was particularly sharp in the second period, taking goals away from Jordy Bellerive with a sliding save on a one-timer and Jake Elmer on the same Lethbridge power play. The Rebels got the lone goal of the opening period when Jeff de Wit hauled in a perfect feed from Brandon Hagel in the final minute, broke in alone from the ‘Canes blueline and beat netminder Liam Hughes with a high backhand. A poor clearing attempt by the Rebels resulted in a turnover at the blueline and an eventual tying goal by Bellerive at 13:18 of the second period, but Chris Douglas buried a five-on-three power play rebound to restore the visitors’ lead four minutes later. The ‘Canes failed to cash in on a trio of power plays in the final frame and Cam Hausinger sealed the deal with an empty-net marker with 27 seconds remaining. Hagel, named the game’s third star, made a great play to clear the zone and along with Reese Johnson assisted on the clinching marker. Hagel has now garnered at least a single point in nine straight games. Hagel’s late show of desperation was indicative of how the Rebels performed from start to finish. “Lots of credit to the forwards, they did their jobs in terms of staying inside the structure,” said Flynn. 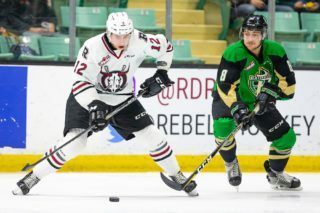 The victory boosted the Rebels past the ‘Canes and into second place in the Central Division, one point back of the Edmonton Oil Kings — who have played four more games than Red Deer — and one point ahead of Lethbridge and the Medicine Hat Tigers. “I think the rivalry is well and good and both teams are ready to get back it tomorrow night,” said Flynn.